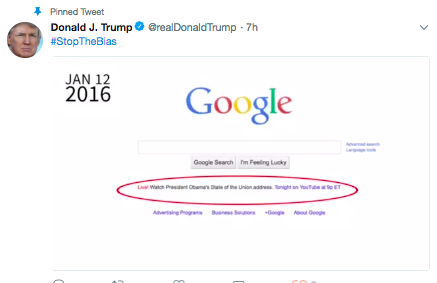 Google is pushing back against a claim by Donald Trump that the search engine stopped promoting State of the Union livestreams on its homepage after his presidency began. Trump’s claim came in the form of a tweeted video, which was still pinned to the top of his profile when this post was published at 9:30 PM PST, Aug. 29, 2018, after Google’s refutation and multiple media reports of its inaccuracy. The video shared by Trump does not make a distinction between a president’s first public speech to a joint session of Congress and his first State of the Union address. A discrepancy in Google’s logo also suggests that at least one of the screenshots, which appear to have been taken from the Internet Archive’s Wayback Machine, was doctored. A Gizmodo commenter notes that one of the screenshots in the video Trump tweeted, from January 12, 2016, shows a version with the previous Google logo, not the sans-serif version introduced in September 2015, which can be seen in a Wayback Archive’s screen capture from January 10, 2016 and other days from that month when a Google Doodle wasn’t featured. Furthermore, while a link to Trump’s State of the Union does not appear on archived versions of Google’s homepage from January 30, 2018, it does show up on a capture from 1AM on January 31, as Twitter user @WrockBro notes. That may be because the Wayback Machine uses Greenwich Mean Time time stamps. Trump’s tweet is the part of his current onslaught against Google, other tech companies and mainstream media, which he accuses of having a liberal bias and burying news about his administration. It is worth pointing out, however, that Trump’s 2017 first speech to Congress was widely praised as “presidential” by journalists across the political spectrum, even liberal publications. In turn, they were ridiculed by critics for being awed by a president acting presidential. 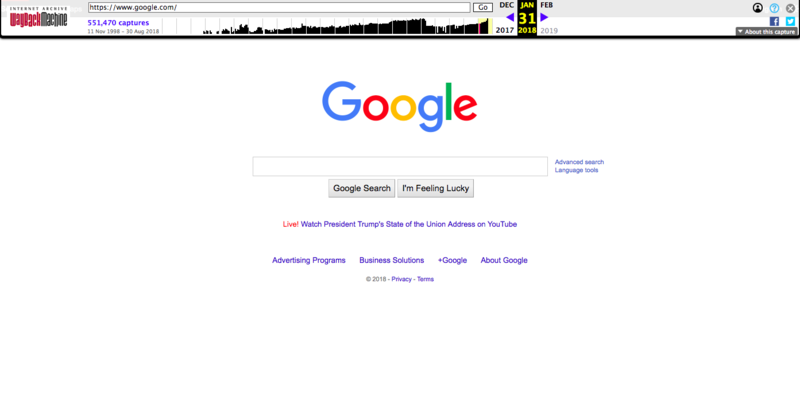 UPDATE: Mark Graham, director of the Wayback Machine, sent TechCrunch a list of more links showing that Trump’s State of the Union address earlier this year was promoted on Google’s homepage. All are shown in Greenwich Mean Time.